Bajaj Group believes that the true and full measure of growth, success and progress lies beyond balance sheets or conventional economic indices. It is best reflected in the difference that business and industry make to the lives of people. Through its social investments, Bajaj Group addresses the needs of communities residing in the vicinity of its facilities, taking sustainable initiatives in the areas of health, education, environment conservation, infrastructure and community development, and response to natural calamities. For society, however, Bajaj is more than a corporate identity. It is a catalyst for social empowerment. It is the reason behind the smiles that light up a million faces. Its goodwill resonates in the two simple words that live in the collective consciousness of Indians Hamara Bajaj. 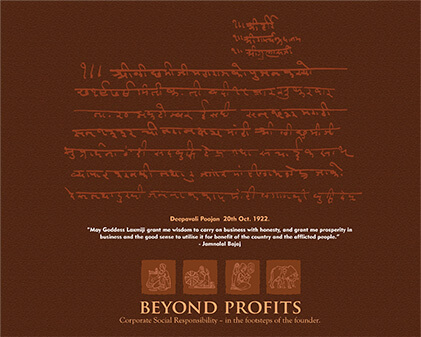 The Corporate Social Responsibility (CSR) activities of Bajaj Group are guided by the vision and philosophy of its Founder, late Shri Jamnalal Bajaj, who embodied the concept of Trusteeship in business and common good, and laid the foundation for ethical, value-based and transparent functioning. The two flagship projects for Bajaj Auto have been the Bajaj Education Initiative (BEI) and the e-Learning Project. The BEI covers 76 low cost schools (a mix of private and government schools) in Pimpri-Chinchwad area of Pune, and supports them with infrastructure development and capacity building. The e-Learning project has reached more than 1550 schools till date- covering Maharashtra and Rajasthan. Both of these are implemented by Jankidevi Bajaj Gram Vikas Sanstha, our own NGO. In addition Bajaj Auto has supported school infrastructure development, vocational training for entrepreneurship, teach-to-lead as well as scholarships for meritorious students. Bajaj Auto is also supporting Bhartiya Yuva Shakti Trust (BYST) in training 25000 young persons in Aurangabad and Wardha to create 1000 entrepreneurs in 5 years. Over 177 entrepreneurs have been created in first 2 years of the project. The extreme drought faced by many parts of the country, including in Maharashtra in 2014-15 and 15-16, have highlighted the need for water conservation and increasing water availability. Bajaj Auto has been working with Jankidevi Bajaj Gram Vikas Sanstha (JBGVS) on this for a long time and has now expanded the size and scope of this activity to make it a focus area in the coming years. Bajaj Auto, in partnership with other Bajaj group companies, is supporting JBGVS in launching the Bajaj Water Conservation Project (BWCP) at Aurangabad. BWCP aims to cover an area of 21,500 ha over the next 4 years with JBGVS and looking for partner NGO to take up additional 44,000 ha under Bajaj Water Conservation Project. In addition Bajaj Auto has supported Paani Foundation for water conservation work in Maharashtra. Bajaj Auto has continued its support to Swachh Bharat Abhiyan by taking part in ‘Bajaj Majhi City Taka-Tak’ programme run by CRT, Municipal Corporation, Aurangabad and CII. This programme aims to make Aurangabad a clean city, with minimal quantity of garbage going to landfills. Bulk of the wet garbage will be composted or used for bio-gas production and recyclable wastes will be sent to a recycling agency. The process is on and is likely to be completed by end 2017. Bajaj Auto also supported ICRIER in construction of a new Green Building starting in 2016-17. Bajaj Auto works with a wide array of partners on issues related to Health. The supported projects include projects on mid-day meals, clean drinking water, sanitation, blood banks, path lab services in remote mountain villages, breast cancer research, and vision care. Bajaj Auto and YCMH Hospital Pune, in collaboration with NACO, have also been operating the ART center in YCMH hospital. This center supports more than 5000 patients currently. Bajaj Auto has also supported Sri Aurbindo Society, Puducherry, to set up the “International Center of Excellence for Integral Yoga”. Bajaj Auto also supports the Kailash Satyarthi Children’s Foundation in its work on holistic development and empowerment of children. Bajaj Auto has contributed Rs 1 Crore to the Armed Forces Flag Day Fund. Bajaj Auto Has also supported Paraplegic Rehabilitation Center at Khadaki, Pune, with 20 State of the Art wheelchairs. Bajaj Auto has supported Sevagram Pratishthan at Wardha for renovation of Bapu Kutir and associated buildings. Bajaj Auto has also initiated a partnership with Raja Dinker Kelkar Museum at Pune for renovation of the museum. Other supported organisations include Social Work Research Center - Barefoot College(Tilonia), Development Initiative for Self-Help and Awakening – DISHA (Pune), Chinmaya Organization for Rural Development (New Delhi), Prafulla Dahanukar Arts Foundation (Mumbai) etc. The detailed list of associated and supported organisations is available here. The philosophy of social responsibility and commitment to give back to the society underlines the Bajaj way of conducting its businesses for a number of decades. Bajaj Group in its quest for nation building has undertaken various philanthropic activities and social work through its corporate and non-corporate entities besides providing financial support to such causes. The wide spectrum of community development endeavors undertaken by Bajaj companies — embracing everything from health and education to women’s empowerment to water conservation and more — has touched, and changed, many lives. As a part of its ongoing social responsibility, Bajaj Auto Ltd proposes to expand its support to voluntary activities in development sector. The adjoining sections detail the application process to access Bajaj Grants under CSR. Has Income Tax registration under 12A AND 80G. Complies with any additional requirements for implementing organisations in the CSR Rules (under Section 135 of Companies Act 2013). Has a track record of at least 3 years in working in the thematic area AND/OR in the proposed geography. Organisations having both will be preferred. In case of multiple partners, the lead applicant must meet the eligibility requirements listed above. The concept note must provide clarity regarding specific roles of the partners. 2. Complete the Organisation Details and Proposal Details. 3. You can complete the form in English, Hindi or Marathi. 4. Please ensure that all mandatory fields are completed and attachments are uploaded. 5. Applicants should receive a response from Bajaj CSR team within 30 days. 7. Acknowledgement of application, shortlisting or review does not indicate confirmation of grant support. The final decision regarding grant application will be known only at end of final review by the Board CSR Committee. How can I apply for a CSR Grant? I am unable to apply online (because of poor internet or any other technical difficulty). Can I apply via offline process? If you are facing difficulty in completing the online application process, please contact us at csr@bajajauto.co.in. Please do not request for relaxation/waiver of mandatory requirements. Can I apply if work fits in the thematic areas but is outside your preferred areas? Yes. However as stated above, projects from the preferred geographies will be given priority. Can I apply if my existing work area is outside your preferred areas, but I want to submit a proposal for executing activities in the preferred areas? Organisations that are normally not operational in the preferred geographies, but are proposing interventions there, will need to demonstrate how they will be able to operate in new areas and have a robust plan for sustainability of project. Can this grant be used for construction of new buildings or purchasing assets? The project should have well defined and measurable outcomes. The applicant needs to clarify how the use of asset will continue in the long term- specifically mechanisms for maintenance and repairs. The requested grant should normally not exceed 80% of the asset value. Can this grant be used for project operation expenses? The applicant needs to clarify how the activities will continue in the long term- specifically beyond the Bajaj Grant support period. The requested amounts should not normally exceed 50% of organisation’s annual budget (average of last 3 years). Are there any specified minimum or maximum project values for the submission? Are there any limits on duration of projects? Will there be a site visit? Bajaj companies reserves the right to conduct site visits and/or other due diligence activities at any stage in the process. Please DO NOT submit multiple proposals (or composite proposals- where non related activities have been clubbed together). You can however submit a new proposal at a later date once a final decision has been communicated on your previous proposal. Can I make changes to my proposal after submission? Proposals can be updated in discussion with the CSR team (infact we recommend an initial iterative process where the proposal will get fleshed out after discussions.) However once the proposal is put up to internal committees, it cannot be revised. Any revisions will require treating the earlier proposal as cancelled, and revised proposal will be treated as a fresh proposal. The key areas where any changes will trigger this include (among others) location, costs, target beneficiary group, deliverables etc. Do I need to submit any documents or photographs with my proposal? The online process will detail the document requirements. No additional documents/attachments or hard copies are required to be sent directly to Bajaj team. Will any additional documents be required in case our proposal gets approved? Yes. We will share the detailed list of documents required after approval. Additional documents may be requested on a case-by-case basis during review stage also. Will I be provided any feedback in case my application is rejected? You can request us to provide feedback on your proposal. Can I submit my application through other personal contacts in Bajaj Companies? Please use only the specified online channel to submit your application. Will there be an MOU? Yes. Approved projects will require to sign an MOU with Bajaj companies. Please note that while the applications are being made to Bajaj Auto, the final grants may come from another group company or a consortium of companies (based on CSR funds availability). The legal agreement would be with the grant making entity. Can I use Bajaj branding on the project activities? Bajaj branding can be used only after explicit approval by Bajaj companies, and only after the project has been approved. Usage of the Bajaj brand will also require adherence to Bajaj branding guidelines. Please note that while the applications are being made to Bajaj Auto, the final grants may come from another group company or a consortium of companies (based on CSR funds availability). The branding would be as per advise of the grant making entity. My organisation is a for-profit organisation working in the social sector- can I still apply? No. All applicant organisations MUST be non-profit. For-profit organizations can apply in partnership with a lead non-profit, however the nature of relationship between the two organisations must be clearly specified in the proposal and ‘arms-length pricing’ will need to be demonstrated. My organization is not registered in India. Can I apply? No. CSR Rules prohibit such grants. I have been working in social sector for more than 10 years- however my organization was registered last year. Can I apply? No. Your organisation needs to meet the eligibility criterion listed earlier. My organization is registered in India. Can I apply for projects outside India? My organisation does not have 80G- can I still apply? No. All applicant organisations MUST have 80G. Can I get CSR grant for organising a one time event? No. CSR Grants cannot be used for sponsorship of events or for one off activities. CSR Rules prohibit such grants. Can I get grant for supporting my higher education or meeting my medical needs? No. Bajaj Grant cannot be given to individuals. CSR Rules prohibit such grants. Can I request grant for creating a corpus? No. This grant is for project activities only- we currently do not support corpus grants. We believe in “investment in resource creation” for use over generations. We try and identify sustainable projects which will benefit the society over long periods. To usher in a growth oriented society and thereby a very strong and prosperous nation - best way is to educate each and every Indian. To guide and do hand holding for self-help individually and collectively to create excellence for self and for the team work. We believe that activities should be focused around locations where we have our presence and hence can effectively guide, monitor and implement specific projects. Care for the section of the society, which is socially and economically at the lowest rung irrespective of their religion or caste or language or colour.